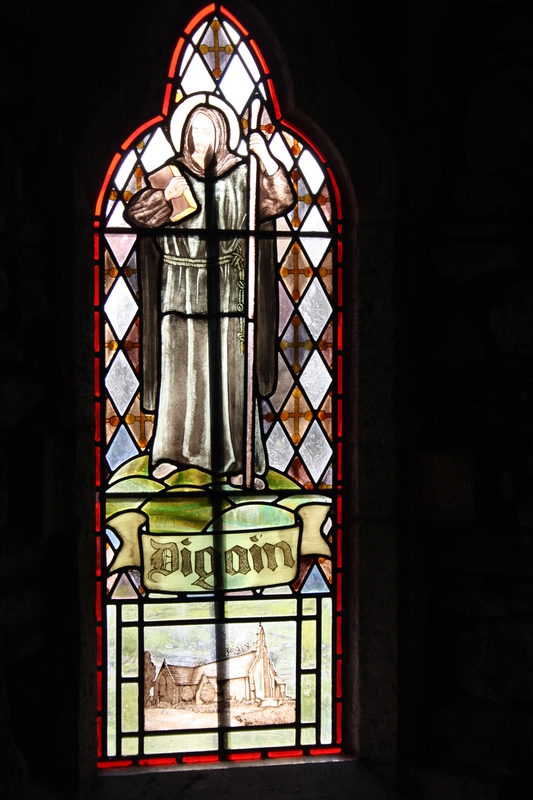 There is little factual information available on the life of St Digain. Digain is reputed to have lived in the fifth century, by legend he was a Cornish prince, born in 429, a son of Cystennin Gorneu. a king of Dummonia ( in modern terms, part of the south west extending into Cornwall) who is associated with the founding of the church at nearby Llangystennin. 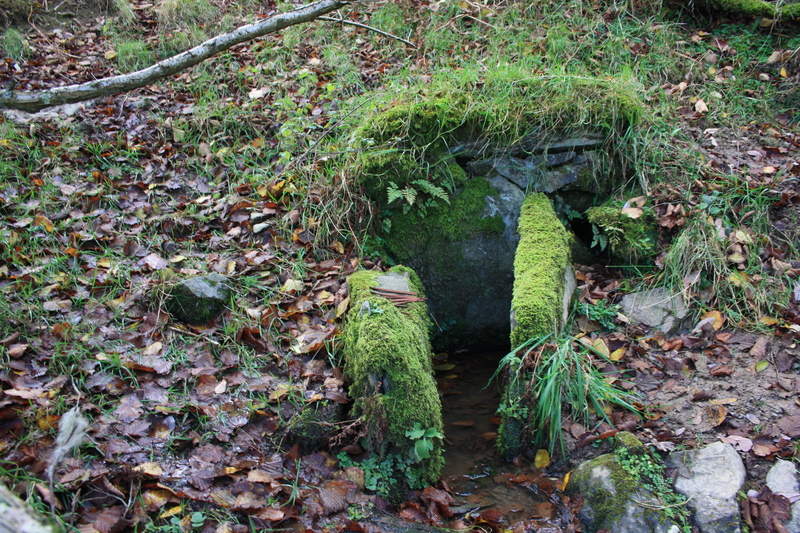 The village by which Digain’s well is found is Llangernyw which may be translated as “the church of the Cornishman”. Digain is shown in a small stained glass window, dating probably from the early Victorian period, on the north wall of the church. As well as this church in Conwy there was also a (now extinct) church of Llangernyw, in the Valley Dore, Herefordshire. 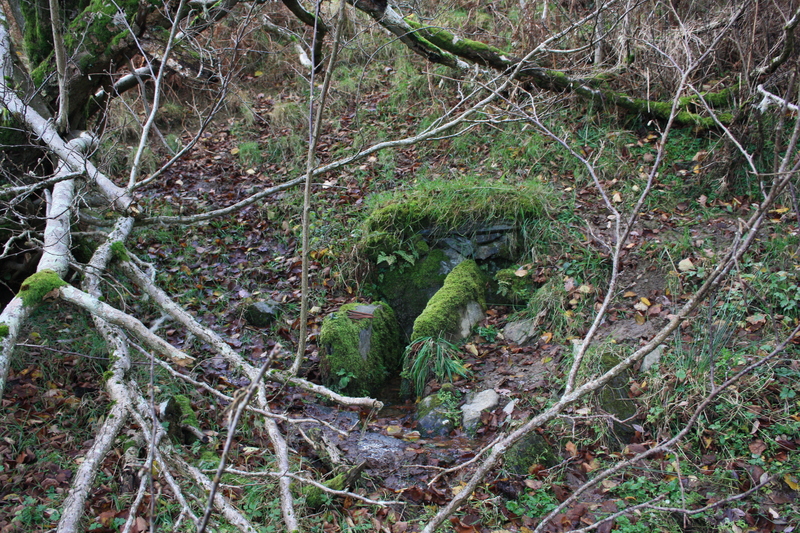 Ffynnon Digain, Digain’s well, lies on a steep hillside about a mile to the north west of Llangernyw. It is relatively undisturbed, although it is possible that at one time it may have had another stone at the front to form a basin, and the record of a visit in the 1990s suggests there may once have been a flat stone lying across the top. 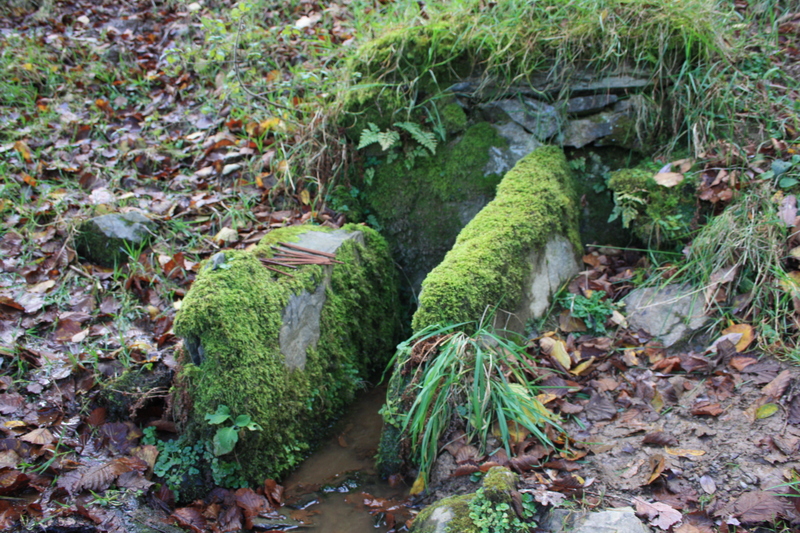 The water flows out from the base of a large stone at the back, which supporting the bank, and is channelled between two other upright stones in a channel around 9 inches wide. Within the channel the water was an inch or so deep, running on a deep bed of silt, so deep it wasn’t possible to determine whether there is a stone at bottom of it or not. 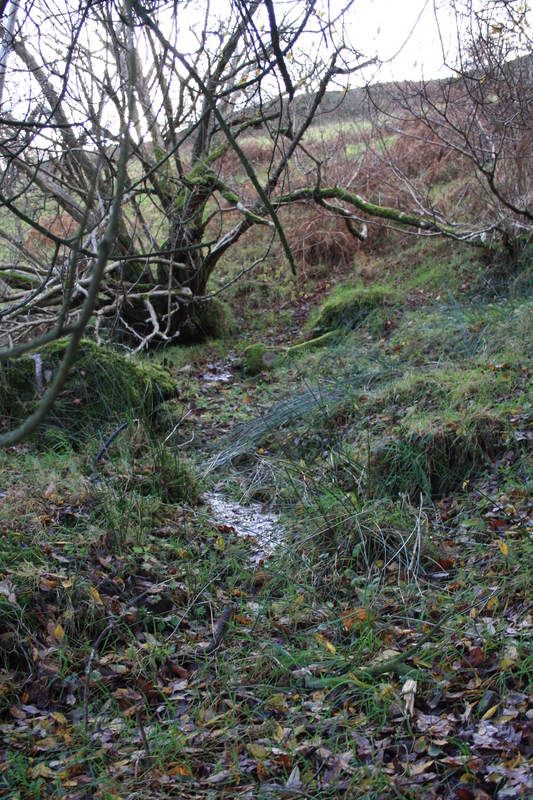 The water flows vigorously, forming a stream that runs down the hillside, collecting in a pool lower down. The well is clearly visited, judging from the collection of burnt incense sticks we found beside the well. Maybe this was because we were there just a few days after St Digain’s feast day which is celebrated on November 21. It is both encouraging and fascinating to know that these wells and the saints days are being remembered, whatever the ceremony that was being carried out. 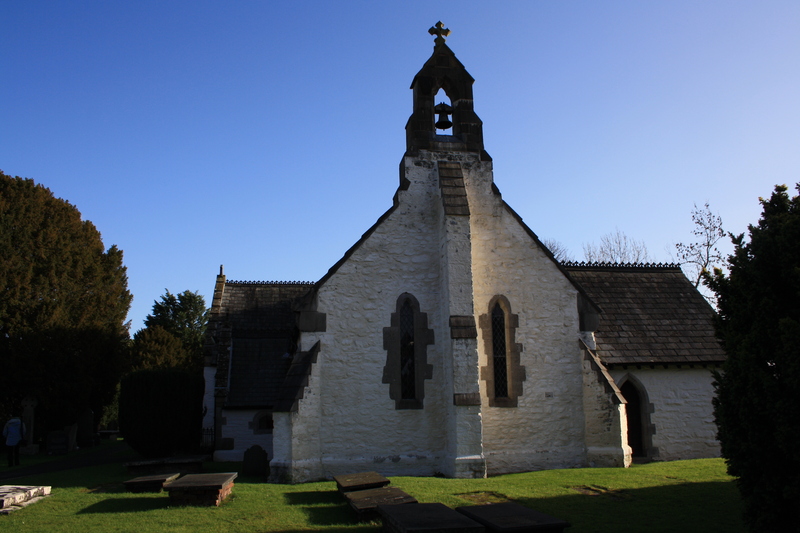 St Digain’s Church at Llangernyw deserves a study of its own. 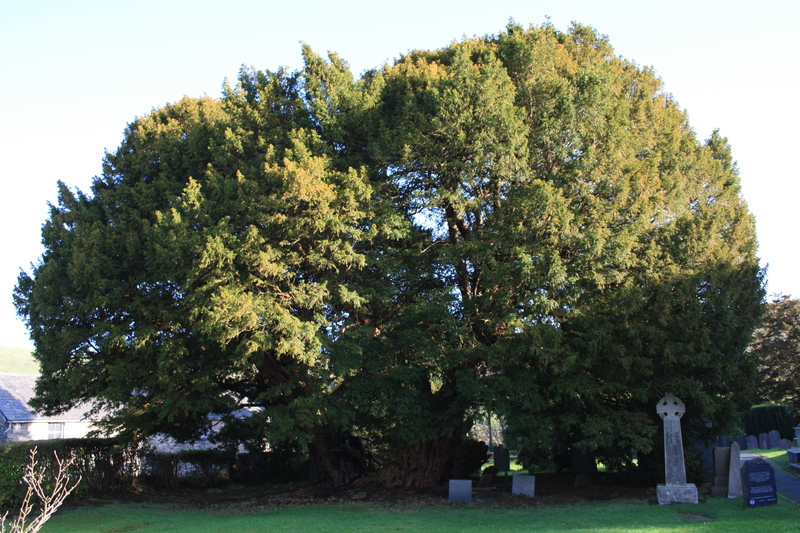 It is built beside a yew tree currently estimated to be around 4000 years old, possibly the oldest living thing in Britain. 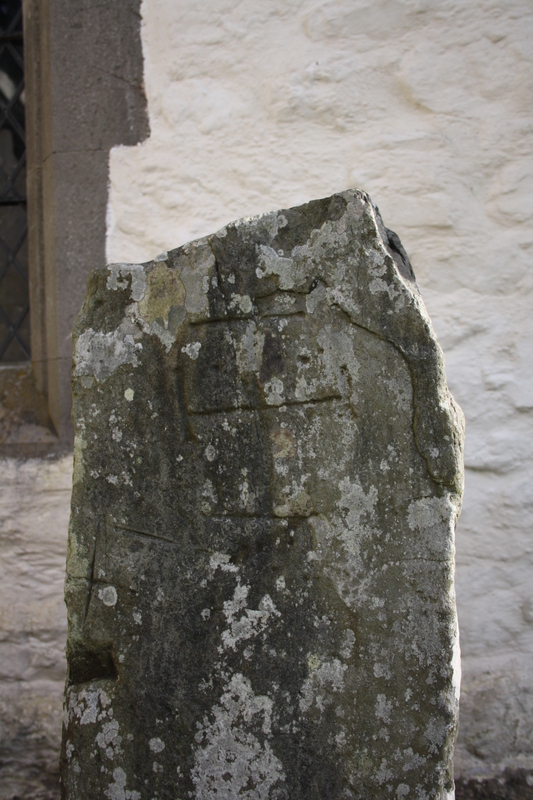 The churchyard also contains two upright standing stones, each with a cross etched into them. These are possibly the sites of Christian burials from the Dark Ages, although other sources consider they may be the remains of an ancient altar. A further two rougher standing stones are situated close to the entrance to the church. The origin of these is probably pre-Christian and they may have stood there almost as long as the tree itself. Finally, the church is the haunt of the notorious Angelystor, the spectral Recording Angel of Death. The Angelystor is said to make its appearance twice a year, at the end of July and again, , most suitably, at Hallowe’en. On these appearances it will read out in a deep voice the names of those people of the parish who will die in the forthcoming year. Having lived in LLangernyw from 1963 to 2008 I find this most interesting. Thank you. Llangernyw was a delightful village, and a prime example of the fact that so many villages that one would normally pass through in seconds, without a thought, actually hold so much interesting history and repay those who stop and visit. ………….and in your time an equally delightful Pub. We had some great weekends there in the Sixties, it all seems so long ago now and you didn’t even know that you had a secret admirer.